All kids need to build, create, move, and explore. 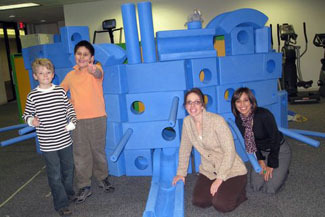 The blue foam blocks that are central to Imagination Playground™ help them do just that. But how can Imagination Playground™ aid in the development of children with special needs? Special Recreation Therapist Paul Mutschler is always looking to find new ways to promote physical fitness and recreation for students with autism. He builds stairs out of the blocks for leg strengthening exercises and uses the blue blocks to simulate ramps used in Special Olympic Bowling. 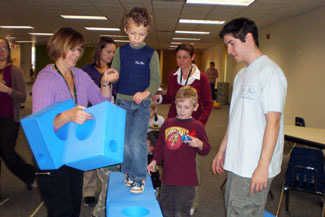 Social Worker Michelle Sas typically incorporates the pieces as balance beams into her sessions to get the kids moving onto various levels and to increase their stability. Many of the students have a hard time finding their bodies in space, so she is trying to work with them on keeping their balance by walking on the pieces without falling off. Imaginary play can be challenging for students with autism, and the blocks help students expand and nurture their imaginations. Some build castles and pretend to be kings, or build stores where they check out groceries. Ernie, one of our students, uses the pieces as "garbage." He pretends to be a garbage man getting his work done by tossing the pieces onto the ground and then organizing them back onto the shelves. When Imagination Playground™ comes into the classroom, students pick up and move the pieces around to different areas, which Michelle feels help them calm their bodies down by providing proprioceptive input. Students with autism have a hard time regulating their bodies. The blocks offer an opportunity for students to compose their sensory systems and prepare themselves to work on academic and therapeutic tasks. Visit Giant Steps online at mygiantsteps.org.